The youngest of three children, Avani was a happy and healthy child until last year. Last October, 4-year-old Avani suddenly began complaining of severe stomach ache which wouldn’t go away. When her parents tried giving her pills for ordinary stomach ache, Avani’s condition got worse. After Avani was taken to a local hospital in Solapur, where they live. Reports revealed a lump in her stomach. Not sure if it was malignant, they asked the family to go to a bigger hospital. 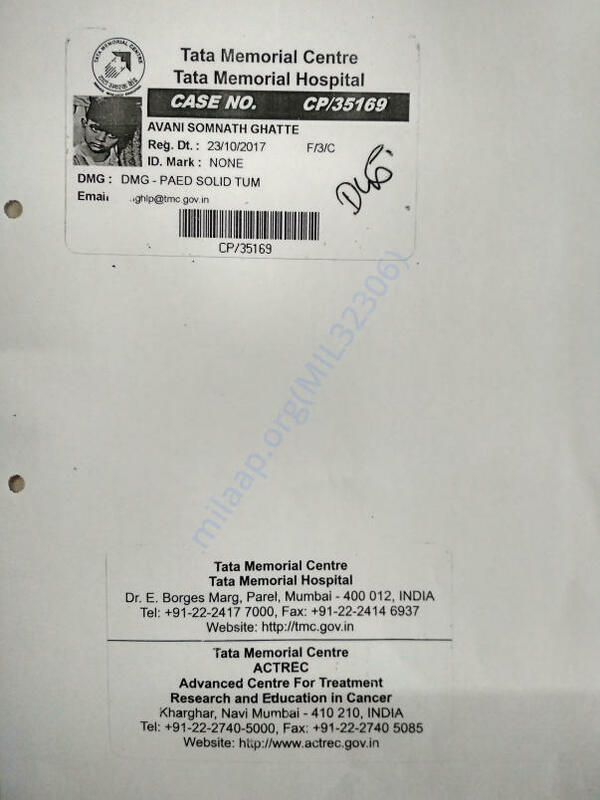 Somnath Ghatte, Avani’s father took her to Tata Hospital, Mumbai. The tests and biopsy carried out there gave Somnath crushing news. 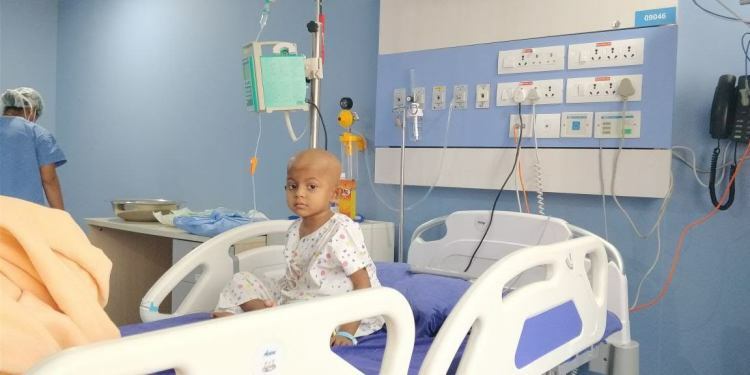 Avani had high risk neuroblastoma, fourth stage. Neuroblastoma is a cancer of the nerve tissues. 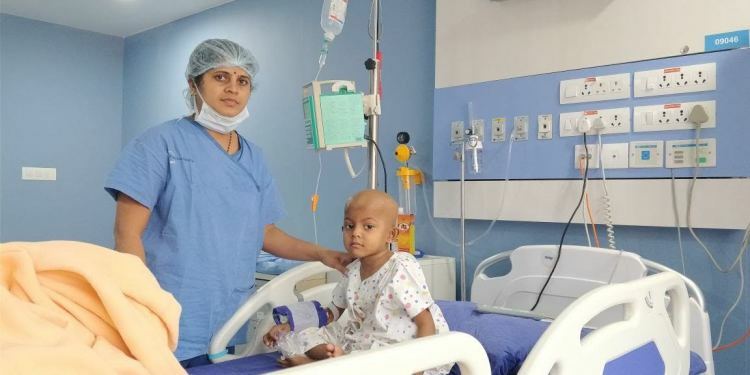 Since December, 2017, Avani has been receiving chemotherapy for three months. However, at the end of three months there was only a 20% chance of recovery. This was disheartening news for the family. Now, the only solution to save her life is a bone marrow transplant. 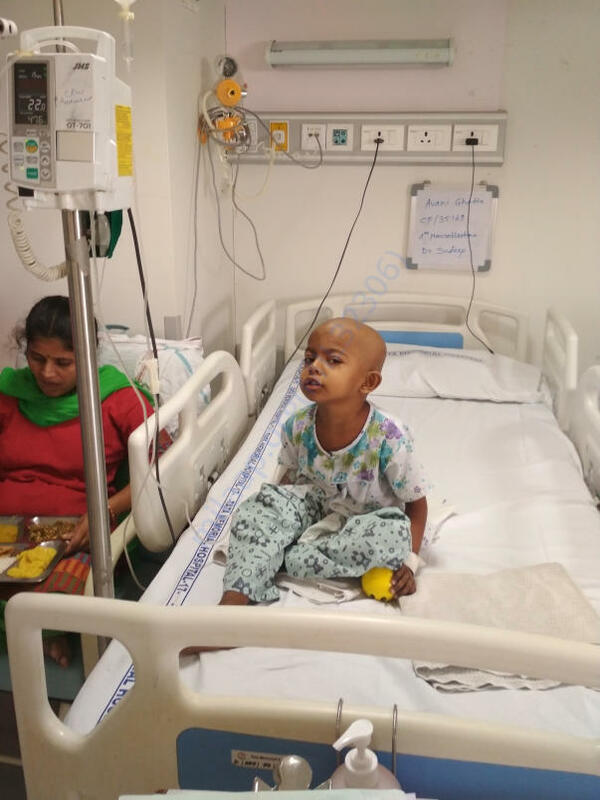 Currently admitted in Kokilaben Dhirubhai Ambani Hospital, Mumbai, Avani needs chemotherapy every six hours. 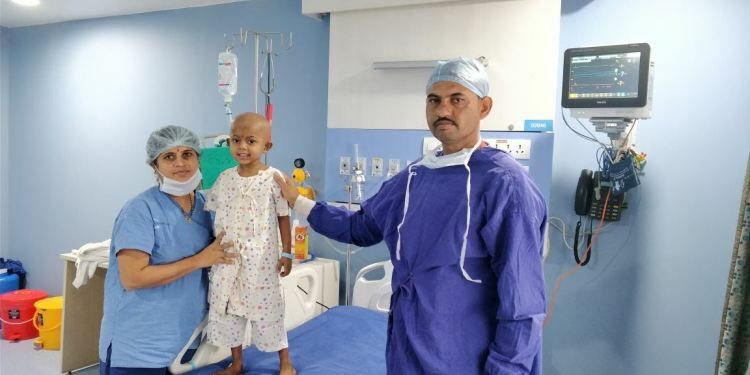 Initially, the little girl was given chemo every ten days. 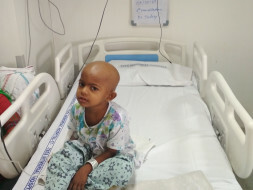 Somnath has spent over Rs 5 lakhs for Avani’s chemotherapy, radiation and medications. However, it is no longer enough to help Avani and only helps in keeping her alive. Emotionally and financially drained, Somnath's only hope now is a bone-marrow transplant. 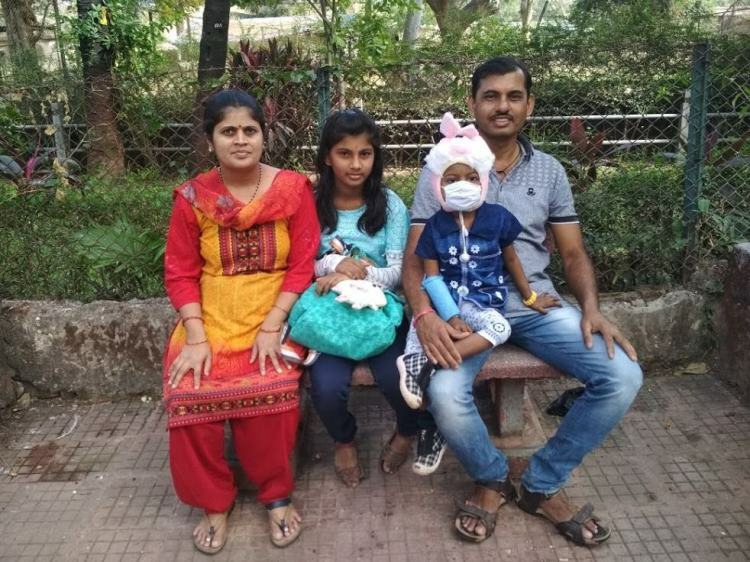 Somnath and Anuja (Avani’s parents), have left their son, Sanket (13) and daughter Aishwarya (10) back home in Solapur. The expense of Avani's treatment is so high, that even paying for the education of his other two children is impossible for Somnath. “It is difficult for my aged mother to take care of my other two children on her own. But, we can’t bring them here. 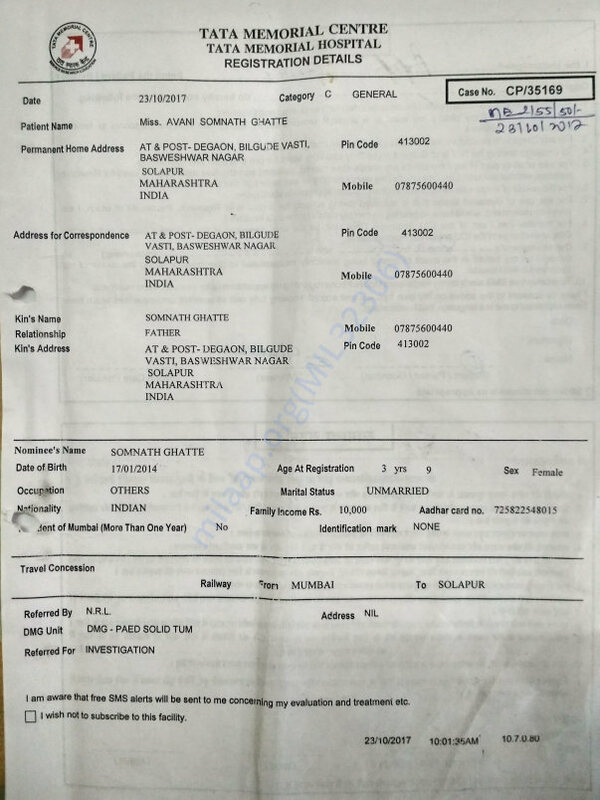 It is impossible for us to stay in Mumbai and bear all the expenses. My children in Solapur are being forced to grow up on their own at a age when they need us most." Avani is already taking chemotherapy to prepare for a bone marrow transplant. The transplant needs to be done urgently. She has been admitted to the hospital and the process of harvesting stem cells has also been done. She needs chemotherapy for a few more days before the transplant is done. 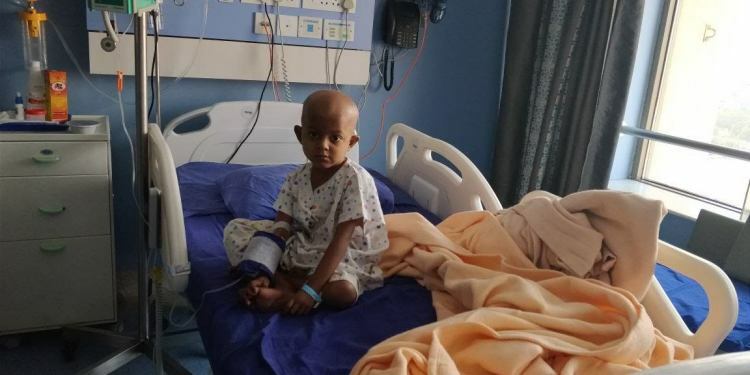 Chemotherapy has made Avani so weak that she cannot even eat. She refuses to eat food even if it will make her feel better. Also, her chemotherapy was stopped due to extreme itching - which rapidly worsened the cancer. Nothing other than a bone marrow transplant will help Avani now. Little Avani will be able to live only if the transplantation is done as soon as possible. The cost of the procedure is high, and Somnath does not have the time to arrange for funds. He has also used up his medical insurance that covered his family. But it covers a small part of the expense only. Somnath’s happy life turned upside down because of one stomach ache that Avani had. Her situation has become so critical now that she takes chemotherapy every six hours. Her father has nothing left to save her except his determination. Only your support can save Avani’s life. Avani is currently at home and is doing fine. We just came from the hospital and doctors have advised for the radiation treatment which will most probably start by next week. Her weight has reduced a bit and she has become a little weak. Will keep you posted about her health. Thank you so much for the love and support. Thank you for the wonderful support that you have shown towards my daughter Avani. 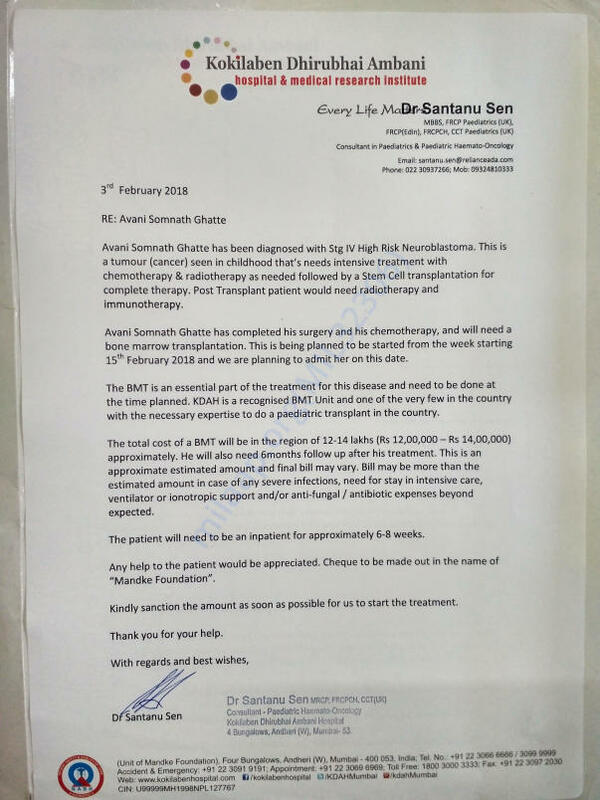 She successfully underwent the bone marrow transplantation procedure on Friday (16th March). She has normal side effects like nausea, weakness, temperature etc. The doctors suggest that she would be recovering from them soon. She is currently on medication and the doctors are trying the control the infections from spreading that she has developed after the transplant procedure. The doctors are also conducting a few tests and after the reports come in, the doctors will be able to suggest the future course of action. Thank you all once again for all the love and support that you have shown towards her. Do pray for her health and speedy recovery. Request you to please share this campaign further with your friends and family to help us in raising funds towards her treatment. Will keep you posted.